Ghana, centrally located on the coast of West Africa, has large and viable populations of wildlife and wild assets [natural heritage] that support a growing eco-tourism industry to complement the nation’s strong cultural and historical attractions. A visit to Ghana’s wildlife parks and other protected areas is like walking into an interesting world of nature. Fortunately for the eco-tourism world, Ghana is only 6 hours from Europe and several airlines link Ghana to the Americas by direct flights. Ghana, the first sub-Saharan African country to gain independence from the United Kingdom, has carved for itself a place in world history by producing a United Nations Secretary General [H.E. Kofi Annan], and is respected internationally as an international peace-keeper, while the 2009 visit by US President Barak Obama confirmed Ghana’s worldwide appeal as a peaceful democratic African nation. The primary objective of the Wildlife Division of the Forestry Commission of Ghana is wildlife protection and habitat/resource conservation for the sustainable benefits of present and future generations. 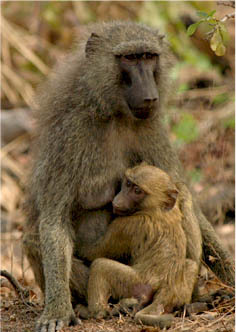 The Division therefore educates the public and fringe communities on the wise use of resources, and managing the protected areas for eco-tourism is one of such uses. Nature enthusiasts, students, volunteers and researchers have found out how much Ghana offers by way of wildlife and wildlife habitats some of which offer good opportunities for adventure. Mole National Park in the Northern Region offers close-up encounters with huge Savannah elephants, baboons and other primate species, birds and large antelopes. On the other hand, Kakum National Park near Cape Coast offers visitors deep insights into the natural world of plants, insects, birds and reptiles and monkeys that may be seen at dawn and dusk. A key feature of the Kakum National Park is the 370-metre long suspended canopy walkway 40 metres above the forest floor. Kakum is only 30km from Cape Coast and Elmina, whose castles are among others are recognized as world heritage sites and the oldest European buildings outside Europe. These huge castles are repositories of history relating to the slave trade. Ankasa Conservation Area, made up of three protected areas in the Western Region, lies on the border of Ghana with the Ivory Coast and represents the only wet evergreen protected area in almost unspoiled state. It is home to over 800 plant species including some endemic ones like the recently discovered Psychotria. Ankasa also records over 600 butterfly species, and primates are represented by six confirmed species including the white-naped mangabey and 3 unconfirmed species including western chimpanzee, the Roloway Diana monkey and the Western black-and-white colobus. There are over 200 different bird species. Adventure seekers make their way to the Volta Region where wildlife-protected areas also have waterfalls. 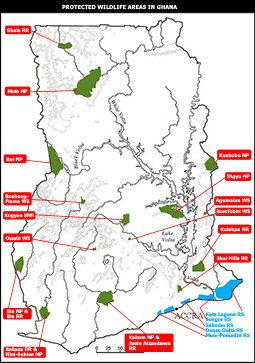 These enclaves include the Kalakpa Resource Reserve and the Agumatsa Wildlife Sanctuary. In the northern part of the Volta Region is the Kyabobo National Park, which offers physical adventure in reaching the Kyabobo waterfall and visits to very interesting traditional villages. Kyabobo is dominated by hills, and two of these form the popular ‘breast mountain’. 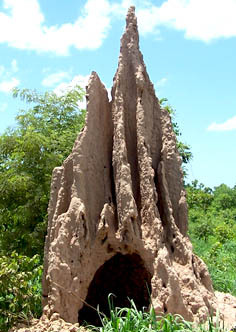 On the other hand, Bomfobiri Wildlife Sanctuary in the Ashanti Region has remarkable rock formations and caves for the adventure-minded. Visitors interested in the offerings of wetlands and Ramsar sites elect to begin their wildlife adventures with the Keta and Songhor Lagoons to see indigenous and winter migratory birds, and then also wait out July and August to see turtles that include the green turtle, olive-ridley and the leatherbacks. Keta and Songhor are interesting also because of the artisanal fishing that takes place there. The other Ramsar Sites include the Sakumo lagoon and the Densu Delta, at the eastern and western ends of Accra respectively, and the Muni Pomadze at Winneba. Boabeng-Fiema in the Brong Ahafo Region has a traditional monkey sanctuary for Mona monkeys and Black and White Colobus. What makes this eco-destination special is that for centuries, the monkeys have co-habited in the communities with humans, and command a funeral when they die. It is perhaps the only village in Africa with a special cemetery for monkeys. In Ghana, you can travel around the national protected areas for unforgettable wildlife experiences with friendly eco tour guides. You are most welcome to our country, which offers culture, warmth and much more.